This dish is pretty straight forward and simple, but tasty and looks impressive. When my daughter was little she loved salmon and would request salmon with steamed broccoli and rice! Honest, that's what she would ask for. I first started to make salmon on the George Foreman Grill, the little one. I had one just for fish. It took 4 1/2 minutes to cook. I would just put a piece of salmon on a plate and pour some Goya Mojo Marinade over it while the grill warmed up and Viola! It was done, and my little girl loved it. The grill was nice and it let me know how to cook the fish for the right done-ness. I hated the clean up of the grill though...I couldn't just plunk it in some water and clean it. It dripped all over and I used too many paper towels...well you get the idea. So then I started baking it in my...you guessed it...stoneware baking dish, and was able to finally get the timing down so it is cooked right. This is a new dish that I got from CSN after I used a gift certificate that I won from Seaside Simplicity. I was so excited to win. I have been wanting to replace my rice cooker which gave out after years of use. So after this I was able to get this beautiful Le Creuset 9" square baker it came with a 5" dish too, and my rice cooker! How cool is that? Thanks Martha! I tried to get a photo of the dish...sorry it's blurry. That's what happens when you take photos as you cook, then check them out on the computer after everything is all done. Too late. 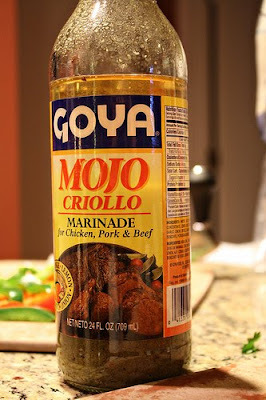 I found we really like Goya Mojo Marinade best, and it is actually made near us here, up in Palmetto Florida, so that's extra special. Plus if your child likes it, and eats fish because of it... why change anything? Drizzle a little oil in the dish so the fish won't stick, then pour on some mojo over it all. Sometimes I will put some French fried onions crumbled on half of the fish for us. This time I ventured out and used some of my Dukkah nut and spice mix. This recipe makes a lot so I just freeze it and pull some out when I need it. I use it in salads, or on Chicken Breast with Goat Cheese and Dukkah. I'll bet you'll find more things to use the dukkah on or in. Okay... so after the fish is in the dish, and mojo poured over top, sprinkle or dump some on some dukkah and press it in a little. You can drizzle a little more oil over the top if you like, I didn't do that this time. I guess it's not really "crusted" with the dukkah it more like "topped" . Sometimes when I do crust it I might use dijon or something else to make it stick more. Bake 20 minutes at 350°F - or if it is a thick piece like this one was, I baked it 25-30 minutes. It came out nice and moist inside and a little crunch of the spice/nut topping. My daughter is widening her tastes and ate it with the dukkah on top (usually she'd scrape it off). This time of year for some reason we find sea urchins washed up on shore. I try to pick the ones that are already dried out and the spines are off. After cleaning and drying and glittering...we make them into snowmen...Maranda's idea. The sea urchin look really cool over the tiny lights too. Another fun way to use them, this was my friends idea to make it into a jellyfish. ...and this is why. Usually we have a chair here and Tucker sleeps behind it and has for years. So every Christmas we invade his "room" and put the tree there. So we give him room to get back in his space! I guess we could set it up in the living room! This is what I do with the scallop shells that I collect all through the year. ( I have a lot of feathery things on my tree). Do you have something special that you make each year? Here's hoping your holiday planning is going well! So lovely to personalize your ornaments! Very creative of you Lyndsey:D And congratulations on winning that lovely dish, that salmon looks delicious in it...wishing you Happy Holidays! Beautiful ornaments! I've never heard of Goya Mojo Marinade, but your salmon looks so tasty; I can almost smell it.looks so healty good. What alovely dish & tree & doggie! Nice home & comforting meal. Those ornaments were really lovely and your salmon looks delicious. wow..wonderful post ...enjoyed the clicks.. Your tree ornaments are brilliant. What an amazing and creative idea. And the salmon! I wonder if I could find that marinade here - I will let you know if I do. First off...what creativity your Maranda has within her...just adorable and very original. Finally...yum on that salmon delicacy. I love stirring things up when putting one of my favourite dishes together. Thanks for these ingredients. The salmon looks good. I very much like the sea urchin snowmen. What a fabulous idea! That sounds like awonderful salmon dish.. Your salmon dish look so good and comfort. Ya, refer your comment leave in my blog about fresh turmeric, using the fresh turmeric giving a better aroma than powder turmeric. Wishing you a blessed Christmas and Happy New Year. I really love the sea urchin ornament. And salmon is one of our favorites in our kitchen. I wish you a very merry Christmas filled with wonderful food, family and friends. Happy holidays to you and your family. Be good 'cause Santa Claus comes tonight. Your salmon sounds delicious, love it! Your home is very pretty with all the beautiful decorations. Tucker is a doll!!! Merry Christmas to you and your family! The salmon flakes perfectly! Yummy! Delicious salmon I can't wait to cook this! Lovely decor and cute doggie!